CRITIQUE OF BRUCE CUMINGS "THE KOREAN WAR"
In his Introduction on page xviii in the first full paragraph he makes the following statement. "The British author Max Hastings wrote that Communist atrocities gave to the United Nations cause in Korea 'a moral legitimacy that has survived to this day.' His end note 1 at the end of that statement indicates that the original statement appeared on page 105 of Hastings 1987 book "The Korean War"
FACT: There is nothing about atrocities on that page in Hastings book. The first part of that page contains a description of a number of Marines who participated in the Inchon landing. The first full paragraph on that page describes the condition of the convoy's ships. "The second full paragraph reports the appalling conditions on the invasion convoy, including the effects of Typhoon "Kezia". The last paragraph on that page talks about an officer in the 17th Regiment of the 7th Infantry Division. On page 9 of Chapter One, the Professor writes about a clandestine American plan to launch a coup to unseat Chiang Kai-shek. His end note #6 lists Chapter 14 of his book "The Roaring of the Cataract" as the original source document. FACT: Professor Cumings does this often. A proper source document reference should be an original source document. Where did he get the information in the first place, or did he just make it up? At the top of page 15, Chapter 1, he writes that, "by the beginning of July, he (General MacArthur) wanted a minimum of 30,000 American combat soldiers, meaning more than four infantry divisions." FACT: Since a full strength infantry division has about 17,000 men, 30,000 men would be a little less than two divisions. On page 17, he writes that the North Korean Army's 5th Division worried too much about covering its flanks, instead of moving quickly on to Pohang and thence to combine with the 6th Division marching from the southeast to menace Pusan. FACT: Professor Cumings cannot even get his geography straight! Pusan is on the southeast coast of Korea. Anyone marching from the southeast would be marching in the Sea of Japan! The 6th Division was actually moving from the WEST! This is according to EUSAK (Eighth US Army in Korea) Advisory dated July 31, 1950. They also would have combined with the 4th Division, NOT the 6th as the 4th was to the north of the 6th Division and thus between the 5th and 6th Divisions. On page 18, in the second full paragraph he writes that by September 8, all available combat trained army units had been dispatched to Korea except the 82d Airborne Division. FACT: This statement is an exact duplicate of the one on page 661 of his 1990 book "Roaring of the Cataract". The 11th Airborne Division remained intact at Fort Campbell, Kentucky. It was not until mid-October that the 187th Airborne Regimental Combat Team of the 11th Airborne Division was dispatched to Korea. On page 19, halfway through the first full paragraph, he writes that during the Inchon landings, 80,000 Marines were deposited with hardly a loss. FACT: The initial Marine contingent consisted of the 1st and 5th Marine regiments augmented with armor, artillery and air support. Their total strength was about 30,000 men on the ground. The Army's 7th Infantry Division, augmented by about 8,200 untrained Koreans, for a total of about 27,00 men, made the landing along with the Marines. That would make the total about 57,000 men, a far cry from the 80,000 figure quoted by Professor Cumings. The 7th Marine Regiment, coming from the Mediterranean did not arrive at Inchon until six days after the initial landing. There was also a South Korean Marine unit which was in the initial landing, but I have been unable to determine the number, but it could not have been more that several thousand. On page 29, Professor Cumings writes, beginning with the last paragraph: "as soon as the Chinese intervened in force, MacArthur ordered that a wasteland be created between the front and the Yalu border. This was done in order to destroy all installations, factories, cities, towns and villages in North Korea. The destruction was to start at the Yalu and progress sou\th. It followed Chinese forces into South Korea." "In that 1951 front-page dispatch, datelined 'With Special Task Force, North of Anyang, Korea, Feb 8,' "Mr. Barrett wrote that the American Commanded armored column he was accompanying 'took a little hamlet north of Anyang that will go down as a macabre tribute to the totality of modern war.' "Graphic Picture of Death" "A napalm raid hit the village three or four days ago when the Chinese were holding up the advance, and nowhere in the village have they buried the dead, because there is nobody left to do so. This correspondent came across one old woman, the only one who seemed to be left alive, dazedly hanging up some clothes in a blackened courtyard filled with the bodies of four members of her family. The inhabitants throughout the village and in the fields were caught and kept in the exact postures they had held when the napalm struck - a man about to get on his bicycle, fifty boys and girls playing in an orphanage, a housewife, strangely unmarked, holding in her hand a page torn from a Sears Roebuck catalogue crayoned at Mail Order No. 3,811,294 for a $2.98 'bewitching bed jacket - coral'. There must be almost two hundred dead in the tiny hamlet." "Soon George Barrett of the New York Times found 'a macabre tribute to the totality of modern war' in a village north of Anyang." "The inhabitants throughout the village and in the fields were caught and killed and kept the exact postures they held when the napalm struck - a man about to get on his bicycle, fifty boys and girls playing in an orphanage, a housewife strangely unmarked, holding in her hand a page torn from a Sears-Roebuck catalogue crayoned at Mail Order No. 3,811,294 for a $2.98 'bewitching bed jacket- coral' "
FIRST: The Obituary mentions I.F. Stones 1952 book " The Hidden History of the Korean War" as the source of the story, NOT The New York Times! SECOND: The New York Times Archives show that George Barrett filed eleven stories from Korea during the month of February 1951 and the story as recorded in Stone's book is NOT one of those eleven. Thanks to a more detailed review of the New York Times Archives, I found that the "Napalm" story was filed as an add on to a story published on February 9th under the heading "Radio Hams in U.S. Discuss Girls, So Shelling of Seoul is Held Up". Professor Cumings has omitted part of the story in order to put forward and help prove his perspective that UN Forces followed a "scorched earth" policy of napalming all towns and villages after having retreated through them. In his book, he only quotes the part about the effects of napalming and NOT the reason for it. The entire story as filed by George Barrett is a fabrication. FIFTH: Napalm is used to kill personnel at strong points, where there are underground bunkers. The Anyang river flows north past Anyang and the village of Tokson-ni, which is about six and a half miles north of Anyang. Eventually it flows into the Han River just South of Seoul flowing Westward into the Yellow Sea at Inchon. At a point about five and a half miles above Anyang, the river valley broadens out so that by the time it reaches Tokson-ni, that village is surrounded by flat rice paddies for about a mile in any direction. Trying to dig bunkers or even foxholes or trenches would be impossible as they would fill with water almost immediately. (See Army Map Series L552 Maps, Map NJ 52-9 for topography of area around Anyang and Tokson-ni). SIXTH: It seems highly unlikely that there would be an orphanage of fifty children in a village with a population of about 200. The orphanage would constitute about 25 percent of the total population. Not very likely! SIXTH: Why would a woman whose village had been controlled by the Chinese for the previous six to nine weeks be filling out a catalog order form? SEVENTH: How would any Korean pay for an item from a mail order catalog, assuming that they had one? Payment would have to be in U.S. Dollars. I am sure that during the time frame of this event, there were no facilities for changing Korean Won into U.S. Dollars. Beginning with the initial occupation of Japan and continuing on until the 1960's, all military and civilian personnel in the Far East was paid in Military Scrip. Therefore, it would be almost impossible for anyone in Korea to obtain funds in U. S. Dollars! EIGHTH: It seems highly unlikely that a village with a population of about 200 would have an orphanage containing 50 children. NINTH: How would anyone pay for an item in a mail order catalog, assuming that they even had one? Payment would have to be in U.S. dollars. At that point in the war, I am sure that there were no facilities for changing Korean Won into U.S. Dollars. Also, beginning with the original occupation in Japan until well after the Korean war had ended, all personnel, including civilians, were paid in Military Scrip. A friend of mine who was there in mid 1960 told me that at that time, everyone (Military and Civilian) in Japan and Korea was paid in military scrip. On page 73 he mentions a Pentagon War Plan for the invasion of Inchon which was issued in mid June 1950. He does not cite a source document for this information. The first plan for an amphibious landing at Inchon was "Appendix B" to JCS Document 924 "Operations Against Japan Subsequent to Formosa which was issued June 30, 1944. The next plan was "Bluehearts", formulated in early July 1950. Marine Colonel Edward Forney supervised the formulation of that plan. "Bluehearts" called for the entire First Cavalry Division to land at Inchon, but the rapid southward advance of the North Korean Peoples Army (NKPA) forced a change in plans and the Division landed at the eastern port of Pohang-dong. The landing began on July 18 when two thirds of the Division landed. A typhoon interrupted the process and the balance of the division landed on July 22. The next was "Operation Chromite" which was actually a modification of "Bluehearts". It called for a landing by the First Marine Division and the 7th Infantry Division. On page 83, Professor Cumings wrote that 70,000 troops landed at Inchon, earlier, on page 19, he wrote that 80,000 Marines were landed. My comments are listed with comments regarding page 19. Briefly, a maximum of 57,000 troops landed initially at Inchon. The balance of the First Marine Division, the 7th Regiment totaling about 15,000 men, did not arrive until almost a week after the initial landing. On page 103 in the first paragraph he writes: "He released a plutonium-239 bomb called 'the Fat Man,' weighing nine thousand pounds. Dangling under a parachute, it took forty seconds to fall one and a half miles to its point of detonation, five hundred meters above the red domes of the Catholic Church at Urakami,....."
FACT: "Fat Man" weighed 10,800 pounds and the only parachutes involved were those dropped ahead of the bomb by two instrumentation B-29's which were dropped by parachutes just before the bomb was dropped, carrying sensors which sent shock wave information back to those planes. The fall took about 60 seconds and the release point was at 28,900 feet and it detonated at about 1,700 feet so the drop was about five miles to the detonation point. The orders were to have a visible aiming point and the only visible feature was a racetrack. Photo showing "Fat Man" and its specifications is shown below. On page 156, he says that Stratemeyer reported that atomic bomb loading pits were operational at Kadena (on Okinawa) and that the bombs were carried there unassembled and put together there at the base, lacking only the essential nuclear cores or "capsules". He also writes that the cores were sent to Guam. FACT: He has an end note #12. That first refers to pages 750-51 of his "Origins of the Korean War Volume II - The Roaring of the Cataract". Those two pages each have three end notes, 135 through 140. In reading the extensive explanations of each of those end notes, only one of them, #139 appears to have any relevance. Cumings second part of end note #12 refers to Richard Rhodes 1995 book "Dark Sun - The Making of the Hydrogen Bomb" pages 448-51. On page 449, Rhodes wrote that on April 5, 1951, Gordon Dean, the newly appointed Chairman of the Atomic Energy Commission (AEC) looked into the procedure for transferring nuclear capsules to the military. Mr. Rhodes is a good storyteller and if he is purporting to record facts, he should stick to the actual facts. FIRST: Mr. Dean was appointed in May 1949, over two years earlier. SECOND: the Joint Chiefs of Staff sent General MacArthur a Top Secret Teletype on July 31, 1950, notifying him that ten atomic bombs had been sent to Guam and that if he got prior Presidential approval, he could have the weapons within 72 hours. THIRD: The First Aviation Field Depot Squadron had completed Special Weapons training at Sandia Base, Albuquerque, New Mexico in November and was operational at RAF Station, Upper Heyfield, England in May 1951, SO A PROCEDURE HAD BEEN ESTABLISHED. On page 450-51, Rhodes quotes a statement by Gordon Dean, the head of the Atomic Energy Commission. Mr. Dean stated that nine complete Mark IV nuclears had been transferred to the 9th Bomb Group which deployed to Guam subsequent to April 11, 1951. The 9th Bomb Group and its replacements remained on Guam, as did the bombs until about November 27th, 1951 when it was recommended that the deployment to Guam be discontinued. When nuclear weapons were sent to Guam in July 1950, General MacArthur was notified in advance by a Top Secret teletype from the Joint Chiefs of Staff. (copy of teletype appears below). I was unable to find a similar teletype sent between March and May of 1951. I was assigned to an Air Force Special Weapons unit whose mission was to maintain and repair nuclear weapons. My specific assignment was to the local Office of the Inspector General of the Atomic Energy Commission. Our specific mission was to assure that all maintenance and repair was done in a safe manner and in accordance with the appropriate Technical Manuals. With that said, with the advent of aircraft with longer landing gear, such as the Twin Engined B-47 Medium Bomber and the multi-engioned B-36 and B-52 Heavy Bombers, atomic bombs did not require special loading pits. They did require a safe storage area with the normal complement of properly cleared and trained security personnel. It would have been pointless to disassemble them prior to shipment and then reassemble them after arrival. The cores would never have been shipped to another location as another safe location with properly cleared and trained security personnel would have been required. Already trained and cleared security personnel would have had to be used and there would not have been enough to provide proper security at two different locations. It would have been impractical to get proper clearances for sufficient personnel for security at two different locations as the average time to get a person properly cleared varied from about six weeks up to six months. Even furnishing one properly manned and equipped security group would have strained the system as security personnel AND operations personnel would have had to have been drawn from existing Air Force Special Weapons Units. That would have impaired operational efficiency of all units involved. See copy of teletype from the Joint Chiefs of Staff on July 31, 1950. Original on file at the National Archives and Records Administration facility at College Park, Maryland (NARA II). THERE ARE ESSENTIALLY TWO MAIN PARTS TO AN ATOMIC BOMB. 1. THE CASING WITH EXPLOSIVES, DETONATORS, BAROMETRIC PRESSURE DEVICES TO INITIATE THE EXPLOSION. 2. THE NUCLEAR COMPONENTS. "FAT BOY HAD A SINGLE BALL OF NUCLEAR MATERIAL WHICH WAS COMPRESSED TO CRITICAL MASS BY EXPLOSIVES MOUNTED AROUND IT. LITTLE BOY HAD A CIRCULAR SECTION OF NUCLEAR MATERIAL INTO WHICH EXPLOSIVES FIRED A SMALL CIRCULAR MASS OF MATERIAL INTO IT IN ORDER TO ACHIEVE CRITICAL MASS. IN "LITTLE BOY" ONE OF THOSE NUCLEAR COMPONENTS WAS SLIGHTLY OFF CENTER SO THAT DETONATION OF THE EXPLOSIVE CHARGES WOULD NOT RESULT IN A NUCLEAR EXPLOSION.. THERE WAS NO SUCH SAFETY FEATURE IN "FAT BOY". THE MARK IV BOMBS WHICH FOLLOWED "FAT BOY", IN ADDITION TO AERODYNAMIC FEATURES HAD A SAFETY FEATURE IN THAT THE BALL WAS LOCATED OFF CENTER SO THAT IF THE EXPLOSIVES WERE DETONATED, THE BALL WOULD NOT REACH CRITICAL MASS. THOSE COMPONENTS COULD ONLY BE ALIGNED WHEN THE PRESIDENT AUTHORIZED IT. 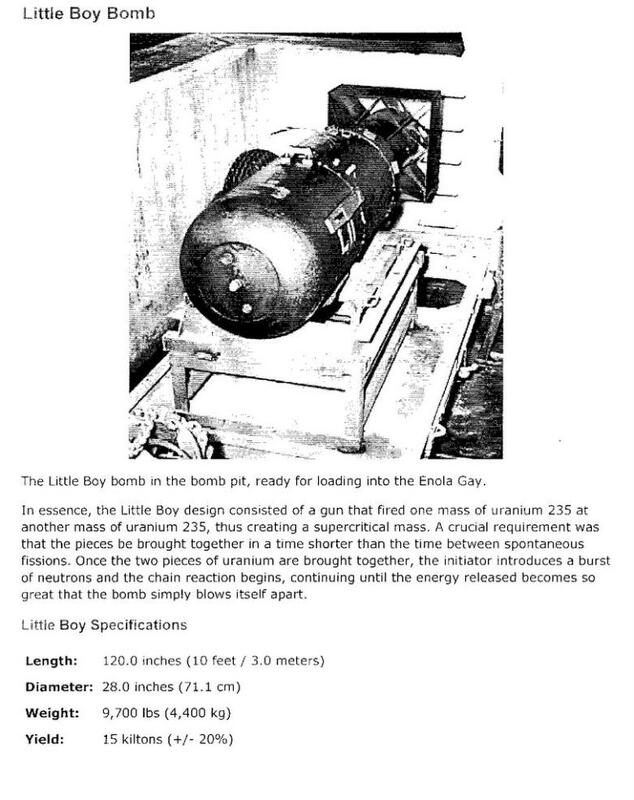 "LITTLE BOY", OR "GUN TYPE" TYPE WEAPONS WERE MUCH LESS EFFICIENT THAN THE "FAT BOY" OR IMPLOSION TYPE WEAPONS AS THE GUN TYPE REQUIRED APPROXIMATELY 185 POUNDS OF FISSIONABLE MATERIAL TO ACHIEVE APPROXIMATELY THE SAME SIZE EXPLOSION AS THE IMPLOSION TYPE, WHICH HAD ONLY ABOUT 18 POUNDS OF FISSIONABLE MATERIAL. The bombs referred to in the copy of the teletype below would have been Mark IV weapons, a safer and slightly smaller bomb with better aerodynamic features than "Fat Man" above. On page 156 Professor Cumings writes about then United States considered using atomic weapons and came close to doing so in April 1951. FACT: While doing research on the Korean War at the National Archives and Records Administration facility located at College Park, Maryland (NARA II), I came upon a number of documents relating to the use of atomic weapons in the Korean War. Since those documents did not specifically relate to my research, I did not make copies. I do remember, however, that at least two studies were made and both of them concluded that there were NO targets which would justify the use of any atomic weapons in Korea. In the middle of the first full paragraph on page 158, he writes ""at the end of March, Stratemeyer reported that atomic bomb loading pits at Kadena Air Base on Okinawa were operational and that the bombs were carried there unassembled and put together att the base-lacking only the essential nuclear cores or 'capsules'. FACT: No nuclear weapons went to Kadena until they were taken there by the 12th Aviation Field Depot Squadron in 1953. In the last sentence of the paragraph on page 159, Professor Cumings writes: "On April 5 the JCS ordered immediate atomic retaliation against Manchurian airbases if large numbers of new troops came into the fighting, or it appears, if bombers were launched against American assets from there." FACT: After approximately 90,000 Chinese "volunteers entered North Korea in late October and early November, General MacArthur asked permission to use bombers to drop conventional bombs on the bridges across the Yalu and on airbases in Manchuria. He was denied permission by President Truman and told that he could bomb bridges spanning the Yalu only if he could hit the North Korean side of those spans. By March 1951, those attempts ceased due to the fact that too much effort was expended with too little results. The JCS had no authority to rescind President Truman's edict! On page 157, he writes about Operation Hudson Harbor. 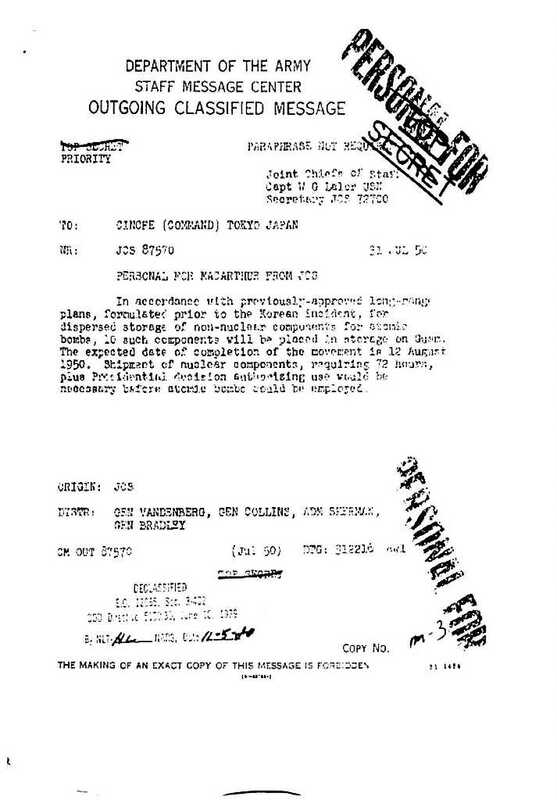 "It appears to have been part of a larger project involving 'overt exploitation in Korea by the Department of Defense and covert exploitation by the Central Intelligence Agency of the possible use of novel weapons' This project sought to establish the capability to use atomic weapons on the battlefield, and in pursuit of this goal lone B-29 bombers were lifted from Okinawa in September and October 1951 and sent over North Korea on simulated atomic bombing runs, dropping 'dummy' A-bombs or heavy TNT bombs. The project called for 'actual functioning of all activities of all activities which would be involved in an atomic strike, including weapons assembly and testing, leading, ground control of bomb aiming' and the like. FACT: This statement is an almost exact duplicate to one on page 752 of his book "Roaring of the Cataract". As stated earlier, several studies determined that there were no targets in Korea which would justify the use of atomic weapons. Professor Cumings is beating a "dead horse". Also, there is no possible way to configure any high explosive bombs so as to simulate an atomic bomb. The word "leading" in the last sentence above probably is a typographical area and should have been written "loading". There is no assembly or testing required for conventional bombs. As for ground control, both high explosive and atomic bombs are released by a bombardier in the aircraft, using standard bombsights. As usual, Professor Cumings has no source referenced. In addition, since atomic bombs are tested and loaded by specially trained personnel, no practice simulations would be necessary. On page 159 he writes 'At 10:00 P.M. on July 27 the air attacks finally ceased, as a B-26 dropped its radar- guided bomb load some twenty-four minutes before the armistice went into effect. FACT: The only radar guided bomb used in Korea was the "Tarzon". When configured with aerodynamic features and a radar set to enable the guiding, the total weight was about 11,000 pounds and it would not fit completely into the bomb bay of a B-29. "Tarzons" were used primarily to destroy bridge spans across the Yalu. The first was used in mid-December 1950 and the last in mid-March 1951. With about two dozen used during that time, they were only able to destroy four bridge spans and one power generating dam. (Their accuracy was to within + or - 250 feet). There use was discontinued for two reasons. First because they protruded from the bomb bay, one bomb armed itself while still in the bomb bay and detonated, destroying the plane and killing all crew-members. A second one did the same, but the bombardier managed to jettison it prior to detonation. The second reason was that only a limited number were available because production ceased because of its defect. Again, there is no source citation. On page 181 hes says that General Walker ordered a withdrawal from Taegu on July 26th. This replicates the same statement made on page 659 of his "Roaring of the Cataract", published in 1990. FACT: There was never a withdrawal from Taegu. When I first questioned Professor Cumings about his statement, he insisted that he meant Taegu, not Taejon because Taejon had fallen several weeks earlier. In fact, Taejon fell on July 22, not several weeks earlier. In the last paragraph on page 181 he wrote that the next day (July 27), "MacArthur flew over to Korea and demanded that the withdrawals cease, and shortly thereafter the 2nd Infantry Division landed at Pusan and was rushed up to the line at Chinju." FACT: FIRST: MacArthur did NOT tell Walker to stop the withdrawals, because if he had, Walker would have issued his "Stand or Die" ultimatum that same day. He did not issue it until July 29th. SECOND: None of the War Diaries for the 2d Infantry Division, including the 9th, 23d and 38th Regiments even mention Chinju. THIRD: The two battalion 29th Infantry Regiment shipped from Okinawa for Pusan with the last of them arriving on July 25. They were attached to the 19th Infantry Regiment of the 24th Infantry Division. They were attached to the 19th Infantry Regiment of the 24th Infantry Division. Elements of both units arrived at Chinju by 1700 hours (5 PM) on July 27, the same day MacArthur flew to Korea. My review of pertinent documents leads me to believe that the purpose of MacArthur's visit was to inform Walker personally in some detail about the additional help that was on the way. The 5th Regimental Combat Team was on its way from Hawaii, scheduled to arrive in the Masan area northwest of Pusan by August 1; the First Provisional Marine Brigade with armor and air support was on its way from San Francisco, scheduled to arrive about August 8th and finally, the 2d Infantry Division was on its way from Seattle with its 9th Infantry Regiment scheduled to arrive first on about August 8th. When I first questioned Professor Cumings, he insisted that he meant Taegu because Taejon had fallen several weeks earlier. In fact, Taejon had fallen only four days earlier. FOURTH: Professor Cumings has NO end ote which identifies the original source document! FIFTH: Professor Cumings makes the same statement on page 659 of his 1990 book "Roaring of the Cataract". On page 192 he writes that State Department officials sought some mechanism for supervising the political aspects of the occupation and that the effective politics of the occupation consisted of the National Police and the rightist youth corps. FACT: The U.S. State Department had NO jurisdiction! According to the records I found at the National Archives, Military Civil Affairs Officers were appointed. For the most part, they appointed the existing local officials to perform under their jurisdiction. For example, Colonel Maurice Crombez, who was Commanding Officer of the 5th Cavalry Regiment of the First Cavalry Division was appointed the Civil Affairs Officer for the Pyongyang Region. Lt. Colonel Harold Johnson , commander of the 3d Battalion of the 8th Cavalry Regiment of the First Cavalry Division was his replacement as Commander of the 5th Cavalry Regiment. "Some question existed concerning the exact functioning of the civil affairs officials and the relationship desired between the UN military and North Korean Government. The following messages were received from CG, I Corps." "1. In order to clarify the functioning of Civil Affairs and sections, the following is furnished for information and guidance: There is no, repeat, no military government in effect in Korea at this time and none contemplated. Civil Affairs Officers have the responsibility of assisting local committees to establish their own government economy. The North Korean people are considered to be liberated and the UN forces will assist them to set up and operate their own affairs. 2. For the information and guidance of all concerned, the following is published: 'The Corps Commander is responsible for the general welfare of the civilian population within his zone of action through local civilian government. He does not discharge his responsibility through direct military control. He places the responsibility for public safety, welfare, medical control, general control and other activities of the civilian community upon the local civil government and assists them through the agencies available to him to the greatest extent possible." In addition, the War Diary for the 7th Infantry Division indicates that for the short time that the 17th Infantry Regimental Combat Team occupied the town of Hyesanjin on the Yalu River in late November 1950, existing town officials were appointed to handle all civil affairs in their local jurisdiction. The National Archives at College Park has the documents supporting this information. There is also additional documentation at the U.S. Army Military History Institute in Carlisle also has some supporting documentation. I have photocopies of all referenced documents.